There are some misconceptions about spinal decompression. The most common truth we want patients to know is that spinal decompression takes time. Healing is not instantaneous, but it is a natural way to reduce pain without surgical intervention, opiod and the risk of opiod addiction. At Carlson Chiropractic we take the time to assess each patient individually and with care. We can give you a second opinion with careful review of your MRI and together we can determine if spinal decompression is right for you. 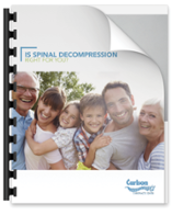 Want to learn more about Spinal Decompression Therapy? Click the link below to download today.